Ten years ago the chocolate industry signed the “Harkin-Engel Protocol”, a promise to eliminate the Worst Forms of Child Labour (including trafficking and hazardous work) in the cocoa sector of Côte d'Ivoire and Ghana, where two thirds of the world’s cocoa is grown. However, none of the Protocol’s six articles calling for action were fully implemented, and the required industry-wide change in the cocoa sector has not taken place. The promise still hasn’t been met. An estimated 1.8 million children work on the small cocoa farms in these countries, growing and harvesting the core ingredient of the chocolate we eat. Many of these are working under what is know as the Worst Forms of Child Labour, which includes trafficking, slave-like conditions, and hazardous work. Cocoa grows in pods on Cocoa trees. The pods are harvested by using machetes, and are sprayed regularly with insecticides. Kids as young as 11 and 12 years old work long days, sometimes 10 hours or more, doing this dangerous work, without any protective clothing, and with little to no access to medical care if they get sick or are injured. They are also forced to carry bags of cocoa pods, weighing up to 40 kilograms. Hardly suitable work for a 12 year old. In the same period as the Harkin Engel Protocol has been in effect, from 2001 to 2011, the global revenue from cocoa products was an estimated USD 1 trillion. That’s $1.000.000.000.000. The cocoa industry therefore certainly has the financial means to tackle the problem. Since the industry has not taken responsibility for carrying out the necessary reform from within, it is now necessary for governments to demand a minimum standard of compliance of companies and require due diligence in their supply chain. Clear and strong legislation is urgently needed as the status quo is simply not acceptable: why should children toil, at the expense of their health, education and sometimes their lives, for an industry so immensely profitable? The best remedy for these abuses is to send the children to school. To achieve that, it is necessary that companies have independent organizations checking their whole supply chain, that they tell the public each year what they’re doing to stop this child labour, and that governments install an independent oversight on progress. 10 Campaign is an informal worldwide coalition of major civil society organizations working in sustainable chocolate. It’s partners include STOP THE TRAFFIK, International Labor Rights Forum, World Vision Australia, Fairfood International, Stop Child Labour - School is the best workplace, Südwind Research Institute, Berne Declaration, FNV Bondgenoten and the Confédération Syndicale Burkinabé, as well as various individuals with extensive experience in sustainable cocoa. How many children work in the cocoa sector of Côte d'Ivoire and Ghana? A projected total of 819,921 children in Côte d’Ivoire and 997,357 children in Ghana worked on cocoa-related activities in 2008 according to Tulane University’s population-based, nationally-representative surveys. An estimated 1.8 million children working in the cocoa sector in both countries, means that there is, on average, one child is working on each cocoa farm as there are between 1.5 and 2 million smallholder farms between Côte d'Ivoire and Ghana. What is the difference between child work, child labour and the worst forms of child labour? In developing countries around the world it is seen as normal for children to help their parents on the farm. In the African context, and especially in the more traditional rural sector, the apprenticeship system is practiced in line with the old African adage – it takes a village to raise a child. A father takes his son to the farm, teaching him how to acquire physical endurance and survival skills. A mother schools her daughter in domestic work, preparing her for her future role of wife and mother. Child work remains a means of socialization and education, and skills development prepares children for their future adult life. Also, it is not only the father or the mother that trains the child in a particular trade, but often a family relative and even other community members as well. The ILO characterizes the term 'child labour’ as work that deprives children of their childhood, their potential and their dignity, and that is harmful to physical and mental development. The ILO Minimum Age for Employment Convention (C138) delimits the age at which children are allowed to work as age 15. Light work, as long as it does not hamper school attendance, is allowed at 13 and 14. Both Côte d'Ivoire and Ghana have ratified ILO Convention 138. Both Côte d'Ivoire and Ghana have ratified ILO Convention 182. To what kind of hazardous labor are children working in cocoa exposed? 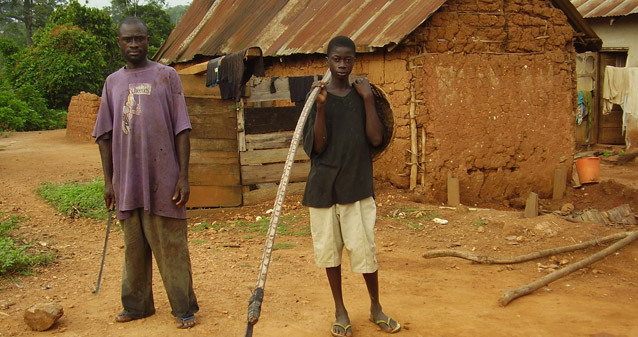 Hazardous child labour in the cocoa sector is very common and includes carrying heavy loads, working with machetes, land clearing and spraying pesticides. In Côte d'Ivoire, approximately 80% of children working in cocoa report carrying heavy loads, while 60% of children working in cocoa report participating in land clearing, activities which are in contravention to Ivorian national law. In Ghana as well, approximately 80% of children working in cocoa report carrying heavy loads, while 57% of children working in cocoa report using machetes/long cutlasses, hazardous activities reported by children in contravention to Ghanaian national law. Approximately 51% of Ivoirian children working in Côte d'Ivoire's cocoa sector and 54% of Ghanaian children working in cocoa reported exposure to injury in the 2008 including wounds and cuts, insect bites, and muscle pains. In 2008/9, there were approximately 263,000 children working on cocoa farms in Côte d'Ivoire working in contravention to the minimum age and minimum hour standards of child work based on ILO Conventions and country laws. In Ghana, during the same time period, there were approximately 270,000 children. In the two countries combined, there were over 400,000 children below the age of 12 years that were working in cocoa farms. 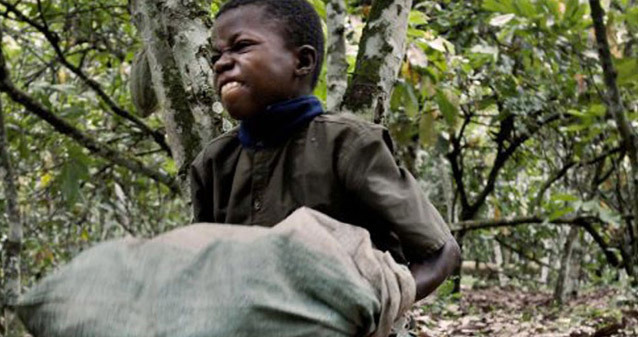 How common is child trafficking in the cocoa sector? Only a fraction of the children labouring in cocoa agriculture are victims of trafficking. 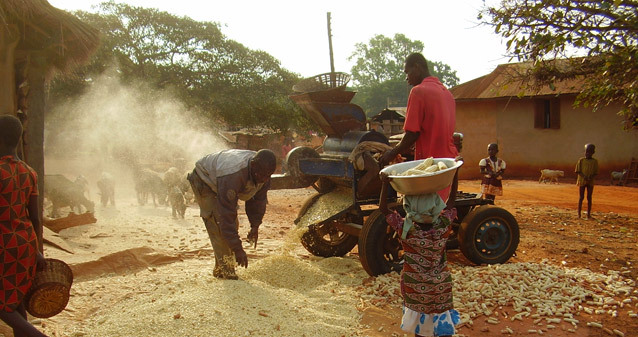 Yet evidence abounds that this phenomenon is prevalent: a non-probability survey conducted by Tulane in Burkina Faso and Mali identified over 400 former child workers in Burkina-Faso and Mali who had been trafficked to Côte d'Ivoire to work in cocoa. Only 2 out of more than 400 former victims of child trafficking had received any sort of social services. What is Forced Adult Labour? ILO Convention 29 defines "forced or compulsory labour" of adults as "all work or service which is exacted from any person under the menace of any penalty and for which the said person has not offered himself voluntarily." The Tulane University surveys carried out in 2008/09 also found evidence of FAL, e.g. indebted servitude, in the cocoa sector of Côte d'Ivoire and Ghana. Both Côte d'Ivoire and Ghana have ratified ILO Convention 29. Is the 10 Campaign focused on child labour, WFCL and FAL? Yes, the 10 Campaign is focused on all three. Unfortunately evidence abounds of child labour, WFCL and FAL in the cocoa sectors of Côte d'Ivoire and Ghana as revealed by Tulane University’s nationally representative surveys. These practices persist and are perpetuated in spite of the country’s ratification of the relevant conventions and the cocoa / chocolate industry’s signing of the Harkin-Engel Protocol to eliminate WFCL in the cocoa sector of both countries. Child labour, even if it is not hazardous, may prevent a child from attending school and may exploit him or her for the benefit of others, effectively mortgaging the child’s future. Moreover, because Côte d'Ivoire and Ghana have both ratified Conventions 138 and 182, the 10 Campaign is not only focusing on the elimination of WFCL and FAL, but also on the elimination of all forms of child labour under Convention 138. Further compelling reasons for this are that (1) companies should not have the right to benefit to from exploitative child labour, (2) every child has a right to quality education and intergenerational poverty cycles will not be broken unless children have a chance to receive an education, (3) all forms of child labour are unacceptable – for any child, and (4) child labour causes and sustains poverty e.g. by depressing adult wages. What is the global revenue from cocoa-based products over the past 10 years? According to the International Cocoa Organisation (ICCO): "In value, the global chocolate confectionery market experienced a significant appreciation, rising from USD 50 billion in 2000 to USD 89 billion in 2009 … representing an increase of about seven per cent per year." The global cocoa revenue over the 2001 – 2011 period is thus an estimated USD 1 trillion. This estimation includes revenue from cocoa-based products in the cosmetics sector, many products of which contain cocoa butter. Who profits the most from the cocoa sector? The cocoa / chocolate industry is dominated by a handful of cocoa processors and manufactures – what we refer to as the BIG 10. The top five cocoa processors (grinders) are: Cargill (14.5%), ADM (13.9%), Barry Callebaut (12.2%), Petra Foods (7%) and Blommer (5.3%). Almost 50% of the entire confectionary market is in the hands of only five companies: Kraft / Cadbury (14.9%) and Mars (14.5%) are followed by Nestlé (7.9%), Hershey’s (4.6%) and Ferrero (4.5%). One may thus speak of an oligopoly of multi-national companies (MNCs) who dominate the market. The most profit is made by the companies manufacturing the finished products. Mars alone, with a revenue of USD 30 billion in 2010, was more than Côte d'Ivoire’s entire GDP that year, which was USD 23.4 billion. The Harkin-Engel Protocol is an agreement, signed by the cocoa/chocolate industry on September 19, 2001, with the principal goal “to eliminate the worst forms of child labor (WCFL) in the cocoa sectors of Ghana and Côte d’Ivoire” in line with ILO Convention 182. The Protocol served as a roadmap by stipulating deliverables in its six articles that the cocoa / chocolate industry would implement by 2005 in order to eliminate WFCL in its sector. Has the cocoa / chocolate industry lived up the Harkin-Engel Protocol? The cocoa / chocolate industry has not satisfactorily implemented any of the six articles featured in the Harkin-Engel Protocol as of March 2011, even after Senator Harkin and Congressman Engel offered the industry two extensions, postponing the deadline for key deliverables until 2010. Furthermore, as “Remediation,” the third component of the industry's "public certification" model, was not rolled out "industry-wide" across all the cocoa growing sectors – the Protocol’s Article 6 is to this day very much unfulfilled. In sum, back in 2001 the global chocolate industry committed to end the Worst Forms of Child Labor (WFCL) and Forced Adult Labor (FAL) in the cocoa sector by 2005. After claiming that this goal was not reached, this commitment was extended to 2008 and then again to 2010. Ten years later, the commitment to end WFCL and FAL has proven to be an empty promise. By shirking their commitments, the global chocolate industry has made a mockery of the spirit and letter of the Harkin-Engel Protocol. In light of the failed Harkin-Engel Protocol “experiment” in industry self-enforcement, it is now time for legislation to be passed that reform a sector rife with human rights abuses. The industry says it has done a lot, spent USD 75 million and that it is working on these issues with the local governments. Isn’t that enough? 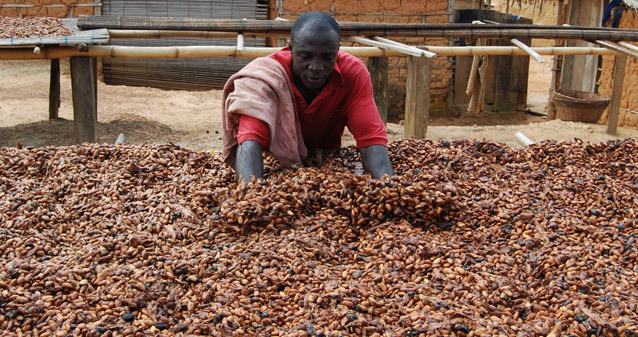 The cocoa industry reported that as of September 2009, it had “invested more than $75 million since 2001 to improve conditions and support the National Action Plans in both countries.” Projects in Côte d’Ivoire and Ghana, corporately funded with Corporate Social Responsibility (CSR) or company foundation resources, include the International Cocoa Initiative (ICI) programme, the Cadbury Cocoa Partnership, Mars’ Partnership for West African Cocoa Communities of Tomorrow (iMPACT), Barry Callebaut’s Winning Together project, Kraft-Care Youth Employment Project, Cargill-Care Rural Education Project (REP), Cargill’s Family Field School (PEFACI) initiative, the Sustainable Tree Crop Program (STCP), and the Nestlé ECOM ICCO ICI Cocoa Plan Initiative. However, while some of these projects have direct bearing on the elimination of WFCL in line with the Harkin-Engel Protocol, other initiatives’ principal focus is the improvement of agricultural (especially cocoa) production. Much of the USD 75 million touted by the industry was spent on other objectives than strictly the elimination of WFCL and FAL. Tulane’s Intervention Database survey of almost all the stakeholders – 43 in Ghana and 40 in Côte d’Ivoire – shows that between 2001 and 2009 implementing partners in Côte d’Ivoire had reportedly received USD 1.2 million from the industry, and implementing partners in Ghana had received USD 4.3 million from the industry to implement projects. Combined, implementing partners in the two countries reported having received approximately USD 5.5 million from Industry between 2001 and 2009 to implement WFCL-relevant projects. 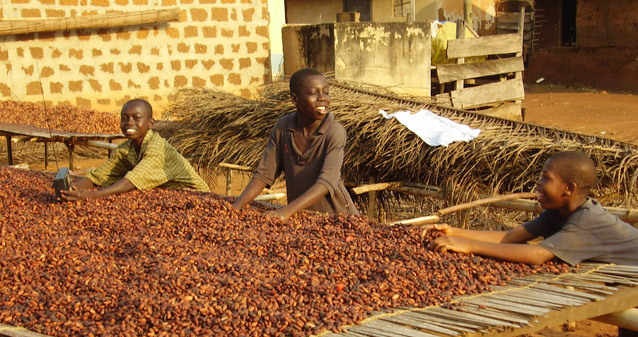 The International Cocoa Initiative (ICI), the joint foundation established by the industry in compliance with the Harkin-Engel Protocol in 2002, embarked on an approach that featured community-level sensitization, mobilization and community-driven action to eliminate the WFCL – the absolute minimum field-based action that Industry could have chosen to pursue given the host of problems in the sector. In spite of the 2008 extension of the Harkin-Engel Protocol of eliminating WFCL, as of March 2011 the industry and the Government of Ghana still had an outstanding 3,463 (69.26%) cocoa growing communities to reach with remediation activities in Ghana, and in Côte d’Ivoire the industry and the Government of Côte d'Ivoire still had an outstanding 3,608 communities (96.21%) to reach with remediation activities. In sum, there remain many more communities that need to be reached in Côte d'Ivoire and Ghana with sensitization and mobilization campaigns, and children to be rehabilitated who are WFCL victims. Industry, first jointly through its pre-competitive Global Issues Group (GIG) and then as individual companies, funded ICI with USD 18 million from 2002 to 2010. Based on ICI’s remediation progress in both countries, in its 4th Annual Report Tulane calculated that Industry would still have to spend USD 46 million in Côte d'Ivoire and USD 26 million in Ghana – a total of USD 75.6 million – in order to cover yet unreached villages with its community sensitization and mobilization campaign. In sum, as of 2010 Industry had spent only 23.8% of the money it would have needed to – just to live up to its own minimal commitments under the Harkin-Engel framework. This fact alone goes to show that the industry has not shown sufficient good will – even just to fund their own commitments. How come? Good question. The fact of the matter is that although the problem of WFCL and FAL is readily solvable, it persists in Côte d'Ivoire and Ghana, which is indicative of the fact that the industry-sponsored “interventions” are not sufficiently targeted or scaled up. The problem is only tackled when there is no longer WFCL or FAL in the cocoa sector! Industry’s job was only to set up the International Cocoa Initiative and get it started! Wrong. How would you live up to the Harkin-Engel Protocol’s commitment of eliminating the WFCL – even missing the first deadline of 2005, the second deadline of 2008, and the third deadline of 2010 – if you cease to fund ICI and its community-based sensitization and mobilization campaign, your chosen vehicle to overcome WFCL? Isn’t upholding labour standards the responsibility of the producing countries? The governments of Côte d'Ivoire and Ghana are, without a question, key stakeholders, and the agents responsible for implementing and enforcing their appropriate legal and regulatory frameworks. Both Côte d'Ivoire and Ghana have ratified Convention 182 on WFCL, Convention 138 on the Minimum Age to Work and Convention 29 on Forced Labour. As such, these governments – along with the companies sourcing cocoa from their territories – have an obligation to live up to these three conventions. The governments of Côte d'Ivoire and Ghana have been working at various levels on the issue. 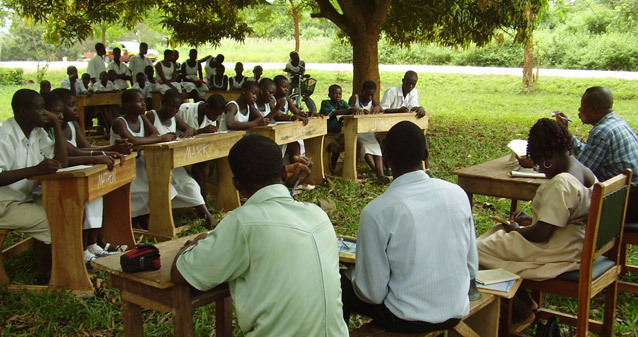 While national programs (the SSTE in Côte d'Ivoire and the NPECLC in Ghana) were created to tackle the issue of WFCL, there remains much work in order to strengthen these bodies to become more effective. The industry has to date insufficiently engaged these bodies. That said, the Government of Ghana has made much progress working in a decentralized fashion with the District Assemblies and also forging ahead with the Ghana Child Labour Monitoring System (GCLMS) pilot program in four sites near Kumasi. Moreover, given the complexity of the issue and the multiplicity of stakeholders, the problem cannot simply be left to the exporting country governments to solve. There are an estimated 5,000 cocoa growing communities in Ghana, and in Côte d'Ivoire approximately 3,750 cocoa growing communities. As developing countries, Ghana and Côte d'Ivoire are resource constrained, struggling to make ends meet at the micro and macro level. Although Ghana and Côte d'Ivoire make up between 60% and 70% of world-wide cocoa exports over the past ten years, their revenue “cut” is in the single digits, hovering around 3-4% of the global cocoa market. In order to ensure the sustainability of the various cocoa supply chains starting at the origin of cocoa, all stakeholders have a responsibility to do their part. Europe for example has the biggest port for cocoa beans, the biggest chocolate factory, and Europeans are the biggest consumers, together accounting for 40 percent of global cocoa consumption in 2010. North America is the world's second largest cocoa consuming area. On average, Germans consume 11.4 kg of chocolate per year, the Swiss 10.8 kg, the British 10.3 kg, Australians 6 kg and Americans 5.1 kg. Western companies thus profit the most from the cocoa business. Furthermore, the UN Principles on Business and Human Rights has made clear that companies have a responsibility to respect human rights and practice active due diligence throughout their supply chains. How much control do companies actually have over the cocoa production process? For years, one of Industry’s principal arguments has been that they don’t know from which farm their cocoa comes from – too many smallholder producers, too many middlemen, cocoa smuggling, etc. This is in part true in the case of Côte d'Ivoire, but not in the case of Ghana.Ghana’s cocoa sector is well regulated with the COCOBOD, and they have buying stations (cocoa depots) all over the country where COCOBOD inspects quality. 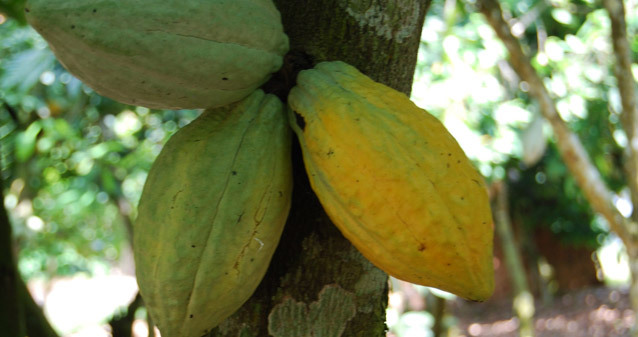 In Ghana, the COCOBOD issues licenses to a limited number of Licensed Buying Companies (LBCs) who in turn furnish the processors. Armajaro, which for example sells organic Ghanaian cocoa to Japanese entities (who reportedly have the highest cocoa quality requirements) knows very well where it sources its cocoa. In Côte d'Ivoire there are many middle-men (truck drivers, warehouses, etc.) that can obscure the origin of the cocoa. However, even there the cocoa processors (e.g. Cargill and Barry Callebaut) are territorial about their sources. Cargill has, as of 2010, rolled out 4 cocoa buying stations to ensure bean quality is maintained and to cut out the middle-man. Cargill in Côte d'Ivoire pays a premium for cocoa from farmers and cooperatives which furnish them a certain quality, and Cargill works hard to motivate its cooperatives, for example sending representatives with handouts into the interior of the country to reward and incentivize loyalty. In both countries there are numerous cooperatives cropping up who have established relationships with the cocoa processors and Licensed Buying Companies (LBC). Furthermore, there is a clear trend in the market to process cocoa in the exporting country to take advantage of low labour and other overhead costs. Barry Callebaut, ADM and Cargill own processing plants in Côte d’Ivoire, and are scaling up in-country cocoa processing. In order the shield themselves from taking responsibility, the BIG 10 hide behind trade associations (NCA, WCF, GIG), and in the producing countries shield themselves from liability by engaging middle men (LBCs). Apparently they are making too much money off the status quo, resisting demands for ethical behavior. In sum, effectively employing an oligopoly over the market, there is a whole lot more control companies exert over the source of cocoa and their supply chains than they would have you believe. Empirical studies have shown that socio-cultural, economic and public sector factors are important predictors for child labor in an agricultural context. In some African countries, children are twice as likely to work if their parents themselves were child laborers, suggesting that child labor perpetuates inter-generational poverty. Conversely, the higher the parent’s level of educational attainment the more likely their children also attend school. Children living in larger households are often more prone to work longer hours in order to generate income. The gender of the head of household is another important determinant of child labor: female headed households, which on average have a higher age dependency ratio, which can increase the likelihood of children being sent to work. The relative economic status of a household, or conversely its degree of poverty, is commonly cited – also in Côte d'Ivoire – as a critical factor of child labor: the rate of child labor increases and school enrollment declines the lower the household’s standard of living. In Ghana, children who work can contribute about 20% to a household’s income, and up to a third if the children work exclusively. Yet children usually are put to work when parental income is below subsistence levels. Under the poverty threshold, with a focus on their daily survival rather than on their future welfare, some families put to use the immediate productive capacity of their children on the labor market. A study of the determinants of child labor in Côte d'Ivoire suggests that the household faces the following decision making tree: where a child's welfare is the only concern, then schooling alone is the first option, but if the household is poor and relies on the child’s income for survival, then schooling and work becomes the first option. Another factor linked to child labor is the availability and quality of the educational system.In Côte d'Ivoire, only 57% of children of agricultural households attended school as shown by Tulane’s 2008/09 survey. In Ghana, that figure was 89%. Inaccessibility of schools or the lack of quality education has shown to reduce school attendance and contributes to child labor. In sum, while poverty is a big factor that results in child labor, it is not the only one: social factors play a big role as does access to primary and secondary school education to break the intergenerational cycles of poverty and keep the children off the farms. What are the most effective measures that would allow child labour, WFCL and FAL to be abolished from the cocoa sector? The provision of public education is a vital service – one lauded as arguably the most effective development “intervention.”A child who attends school is not laboring on the farm, has a brighter future, and stands a chance to break the cycle of intergenerational poverty.Thus, the educational system – in terms of infrastructure, human resources, quality of educational content and school feeding – merits considerable attention, especially in the case of Côte d'Ivoire. Product certification, which entails 3rd-party farm audits, provides independent verification of the absence of WFCL and FAL at the primary production level.With (1) training of producers, (2) criteria for certification, de-certification, and suspension (3) farm-level auditing, and (4) enforcement, product certifiers provide credible assurance that a given product on the market upholds certain standards.Fairtrade, Rainforest Certified, and Utz Certified are three viable certification systems that work in Côte d’Ivoire and Ghana. A Child Labour Monitoring System (CLMS) is community-based surveillance operation with the principal goal of enforcing the rights of the child as stipulated by ILO Conventions and national labour legislation.CLM is the active and continual process of identifying children exposed to exploitation and hazardous work, withdrawing them from WFCL, and verifying that they are in school or some satisfactory alternative. Constituting part of a strategy to withdraw and prevent children from engaging in WFCL, CLMS may furthermore serve as a management tool for: (1) establishing location and magnitude of the phenomenon in question such as children’s workplace, environment or living conditions, and (2) tracking the impact of social protection services or other interventions on the target population. Farmer extension services not only teach farmers efficient growing techniques such as tree spacing and crop diversification, they also reach the producers – the farm-level decision makers – with modules on WFCL prevention.The benefits are not only an increase in yield and thus income, but the occupational hazards and safety education allow farmers to make informed decisions regarding safe and appropriate working conditions on the farm. There are many documented benefits of agricultural cooperatives for its members.Among them, formation of agricultural cooperatives empower its members to diffuse cultivation techniques and innovation, consolidate land, distribute agricultural inputs, add value of primary goods and obtain better terms of trade. In Ghana for example, Kuapa Kokoo is a successful farmer-owned cooperative that even has a 45% stake in Divine Chocolate, a high-end Fairtrade chocolate with revenue of USD 17.6 million in 2010.Increasing and stabilizing the income of farmers would be a major step forward to reduce child labor and increase schooling rates. The implementation of all six of these measures, especially when combined, promise a highly effective strategy to counter the worst forms of child labour in West Africa’s cocoa farms. Does product certification provide a guarantee that chocolate was not made with child labour, WFCL or FAL? In order to qualify for certification, cocoa farmers must understand and meet stringent standards of production.These standards vary depending on the standard setting body, and each has its own set of policies for certification, suspension and de-certification. In the rare event that WFCL is practiced on a farm that has obtained certification status, audits do pick it up. In 2009 for example, Fairtrade suspended one cocoa-producing cooperative in West Africa for non-compliance with ILO 182. This suspension has since been lifted, as the cooperative issued a corrective action plan with implementing practices and agreed to an increased number of follow-up audits. In short, the system works. Since farmers and cooperatives are positively and negatively reinforced on a regular basis to uphold certain standards, product certifiers offer manufacturers and consumers credible assurance that the product has not been tainted with child labour, WFCL or FAL. Various cocoa and chocolate producers have made commitments to procure certain amounts of product certified cocoa and derivative products, the most notable announcement being Mars’ commitment to exclusively procure sustainable cocoa by 2020. Also, a public-private agreement – the Letter of Intent – was formalized in the Netherlands in 2010 to offer only sustainable cocoa for its domestic market by 2025. How feasible is traceability in the cocoa sector? Are you kidding? It’s already being done! All three of the product certification systems – Fairtrade (FLO), Rainforest Alliance, and Utz Certified – apply cocoa traceability and Chain-of-Custody (CoC)methods as a modus operandi. Rainforest Alliance’s traceability system for example provides each certified farmer with a unique code. Certified cocoa is bagged in sacs bearing the unique code of the farm on which it was produced, enabling Rainforest to establish the origin of each bag of cocoa. In the case of Fairtrade (FLO), certified producers and traders of cocoa must show documentary traceability, i.e. contracts, bills of landing, delivery notes, invoices, etc. that show where a product was sourced and to whom it was sold. The documentation is checked to ensure equivalent amounts of FLO product were bought and sold, thus tracking the quantity of FLO product through the supply chain. The Utz Certified program thus also incorporates CoC requirements, which apply to all operations and activities in the cocoa supply chain that involve physical handling of certified products, a change of ownership and that lead to product claims. The fact that all three product certification systems successfully operate traceability – including CoC systems – in both Côte d’Ivoire and Ghana, certainly demonstrates that traceability in the cocoa sector is not only possible, but already in place. Not to mention that many cocoa companies dealing in cocoa have set up their own traceability systems, for example Armajaro Trading Ltd., which has set up a dedicated team specializing in Traceability and Sustainability (T&S).In addition, in order for a company supplying the U.S. government to comply with the Executive Order 13126, traceability – rigorous checks in the supply chain from start to end – is necessary for a company to “certify” that the particular product was not produced with FCL. The statements made on this website and elswhere within the 10 Campaign have been carefully researched by some of the leading experts in this field. You can download an expansive document with references and footnotes at the bottom of this page.